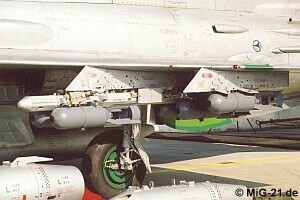 Polish MiG-21bis at Gdynia Babie Doly in 1998. 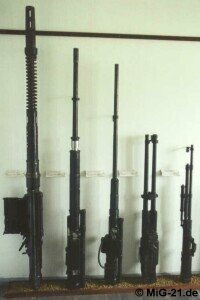 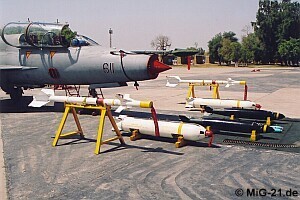 MiG-21's two types of guns: NR-30 (second from left) and GSh-23 (second from right). 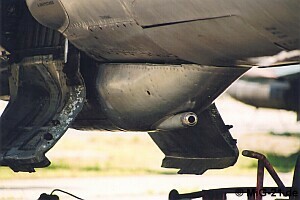 GP-9 gun pod on the central pylon of a MiG-21PFM. 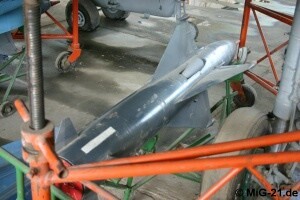 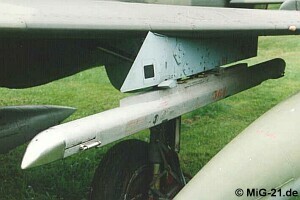 Almost never fitted: Pod with A-12,7 machine gun underneath the MiG-21U. 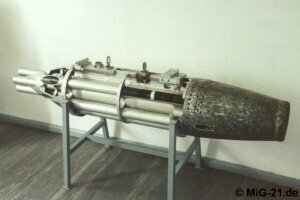 RS-2US, called "iron pig" by the troopers. 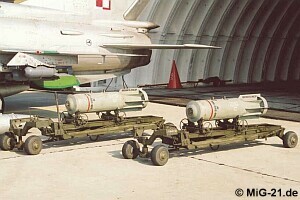 R-3S (product 310) on APU-13 launcher. 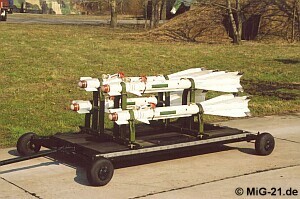 R-13M (product 380, above) und R-3R (product 320). 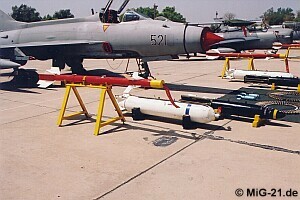 Launcher APU-13MT for R-13M (product 380). 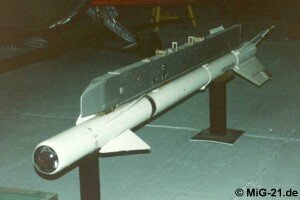 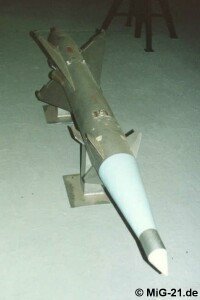 Close combat missile R-60 (product 62). 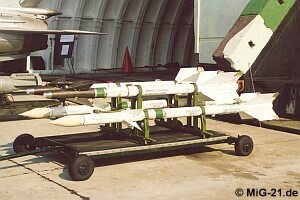 ... R-3R and R-60 (on twin launcher P-62-2). 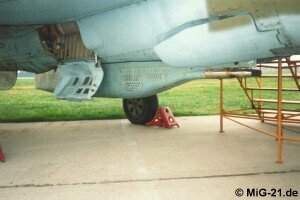 ... and under the wing of a MiG-21SPS. 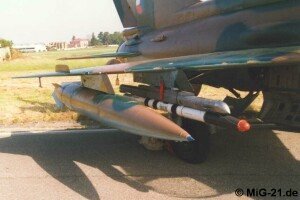 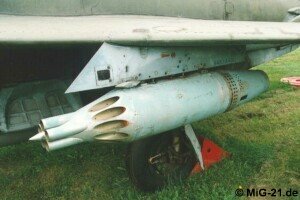 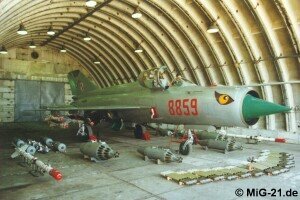 The MiG-21 can carry bombs up to 100kg in groups of four on bomb rack MBD-2-67 and single ones directly attached to the pylon BD3-60-21. 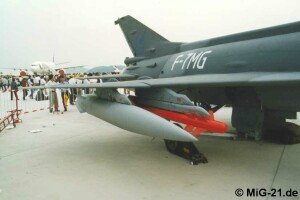 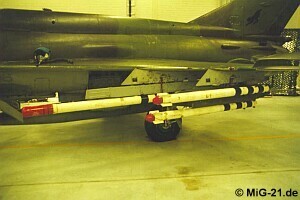 F-7P's weaponry consists among others of Sidewinder air-to-air missiles as well as of cluster and retarded bombs. 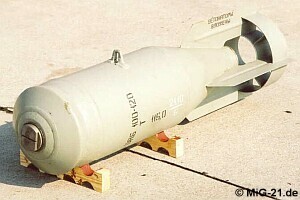 In front of this FT-7P can be seen free fall bombs.